"Why should I get a Hex-Nail? What makes it different?" The Hex-Nail is world's most integrated, advanced, and accurate e-nail on the market today. Boasting complete control from all your personal devices (via Bluetooth 4.0 or Wi-Fi) & features like a Dab Log, Real-Time Temperature Graphs, 5.5" Touchscreen, Glob Mode, and so much more. Our proprietary A.D.M. 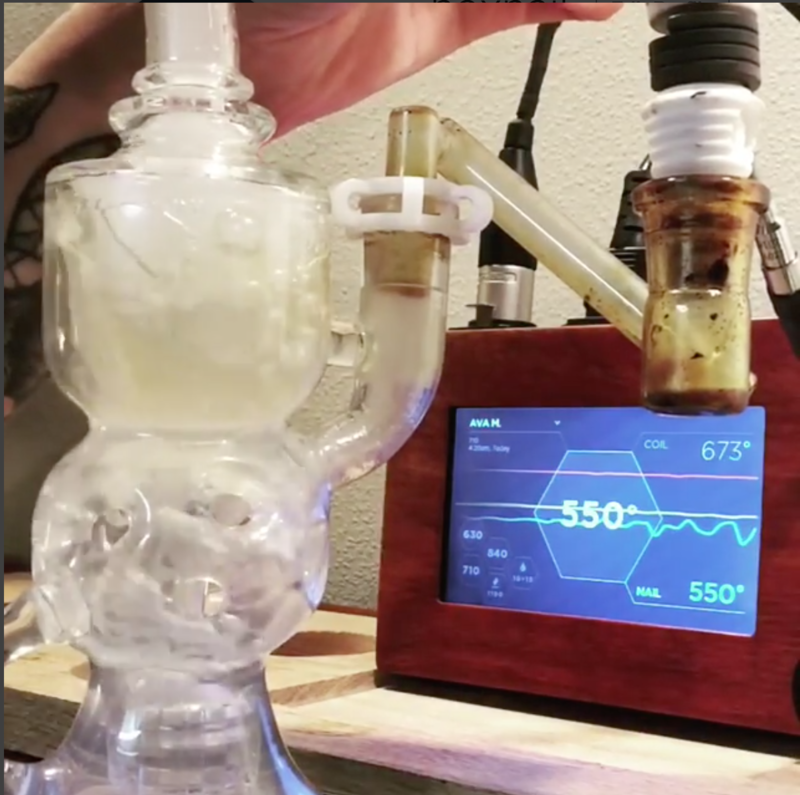 Technology makes it the ONLY e-nail that shows you what temperature you are actually dabbing at. Using real-world analysis of current nails on the market today we can accurately predict in real-time what the temperature of your nail is...instead of just telling you your coil temperature and tossing a calculator in your lap. And that same clunky metal box box we all know and love? Gone. 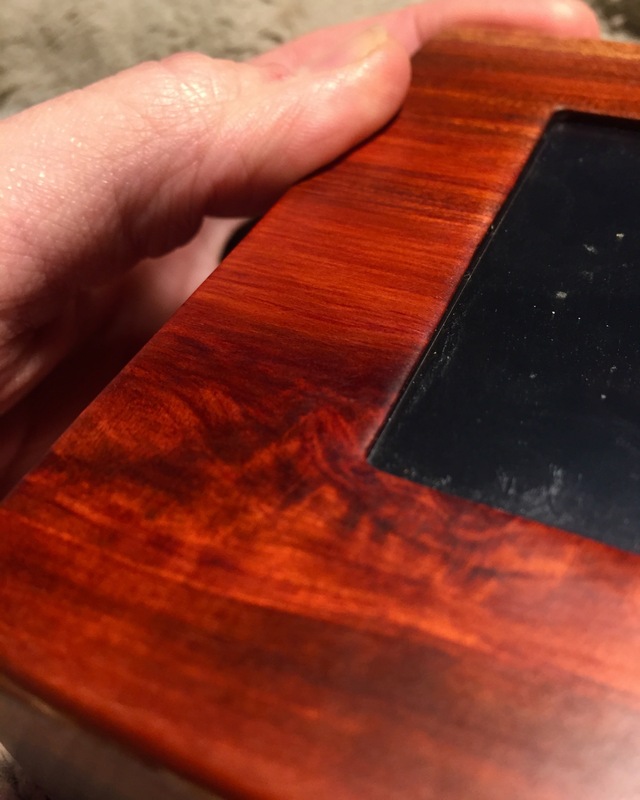 We use high-quality American sourced, quarter-sawn hardwood for our enclosures. CNC Milled in-house to ensure the highest quality standards in the industry. The next piece of the puzzle comes with the finish for the milled enclosure. Over 13 steps of sanding, oiling, waxing, and buffing are applied, by hand, to every single Hex-Nail that leaves our doors. Not to mention over 75 hours of stress testing to ensure that all the hardware is fool-proof & functioning for years to come. And the final piece to the puzzle is our Lifetime Warranty, Lifetime Support, and Lifetime Software & Tuning updates. You'll never be behind the curve with the HN-01. New features are already being implemented every day from suggestions within the community. We give the people what they want, and we can deliver it without forcing our customers to buy a whole new e-nail. Whether you live your life connected to the world around you, or completely off the grid. Hex-Nail is here to not only give you the best, but also the most accurate dab available today. Hex-Nail (HN-01): Now Available Internationally! * - You just need a 220v coil. Current orders include coils as a free Pre-Order bonus. After pre-orders are shipped, coils will be an add-on option to the HN-01 base price of $360. We had left the 220v 'option' off the site until now because we haven't found a vendor we want to work with that carries a 220v coil we're particularly fond of including with the HN-01. There are options out there, but it's much harder to track down a good (but affordable) 220v heater coil than we first expected. We're in the process of trying to find a good alternative from another source to include in pre-orders for international customers. At this point, we are currently implementing a 'No Coil' option to our in-line cart that reduces the price slightly for 220v customers (since we are getting closer to the shipment of pre-orders) to off-set the lack of a coil in their pre-orders. We'll be taking a hit, but we want our friends across the world's various ponds to be able to have a Hex-Nail, too) without simply having to shell out an extra $20 for nothing. It's live on the site now. We're also adding specs to the site during that update to make this all more clear (due to a few changes and time constraints, there are currently none listed.) within the next few days. Let me know if you have any issues and please use coupon code: intrnlshphn01 to take some off for the lack of 220v coil with your pre-order. Note: This is a workaround until we can properly implement regional restrictions for 'No Coil' selection in our in-line cart. If you attempt to purchase within the US with this code for a discount your order will immediately be cancelled. 110v coils are included as a pre-order bonus. The base price at launch for the unit only will be $360 after Round One. A coil free option post-launch will be implemented for everyone, however, after our Round One orders ship. Thank you for your patience while we get this taken care of and implement the changes over the next few days. By the time we ship, if we have found an option that's up to snuff we will offer the coil at a discounted rate (with free shipping) to customers that pre-ordered and would have preferred to receive a new coil. We're hoping to manufacture our own heaters at some point in the future. We have a few designs almost ready, but simply don't have the time (with the finishing touches and upcoming logistics of the HN-01 roll-out) or capital to invest into the actual development of said designs right now. Honestly, as a (currently) 100% self-funded company, we're living fairly hand-to-mouth right now after quitting stagnant careers and moving out of Silicon Valley to make Hex-Nail our full-time focus. The success (hopefully) of the HN-01 will allow us to re-invest the money into RnD so we can start to refine/test our heater designs and fund the expansion of our software development team (which would enable us to implement improved/new tunings & features faster). We dropped 0.3g of Bubbah Kush Shatter dropped on the CCA Liger V3 (30mm) SiC dish. Probably the best dab I've had in my life. We're so excited to dial in these tunings. These Ligers seem to be the perfect pair with the HN-01. We dropped 0.3g Bubbah Kush shatter in 'Glob Mode' and cleared it all at higher than our set temp! Guess this ol' thing works after all. We especially loved seeing the temp rise as we poured more shatter on. Most Popular Wood So Far? 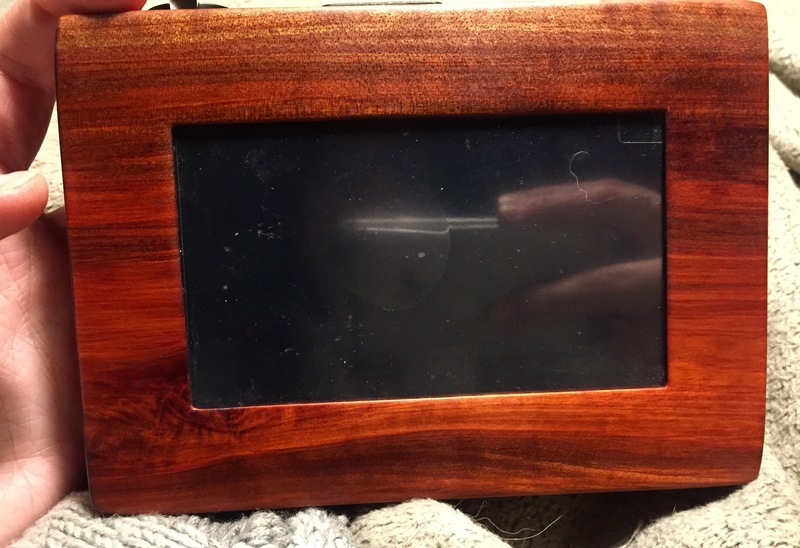 Bloodwood. 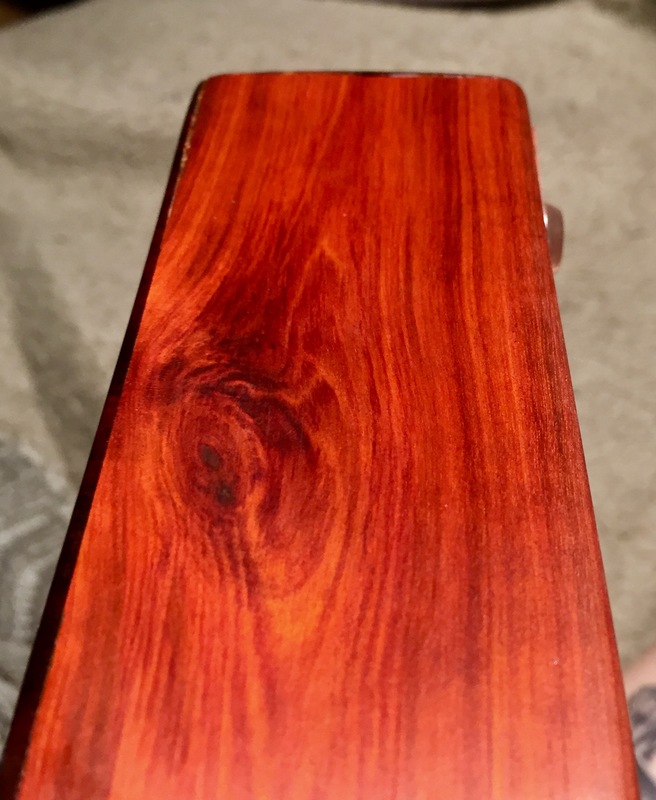 I'm hoping to have a blog post up with more information about each wood within the next day or with more about the grain / finish characteristics of each wood...but for now here's some new shots of our front-runner: Bloodwood. Remember though...The only real difference wood choice besides cosmetics (and workload for us, some of these woods are tough to mill properly) is the weight of the unit itself. Some of the woods are more dense than others so a little heft is added to those. There some durability differences between our options, but as long as you don't plan to you know, toss the controller against the wall...there should be no difference concerning functionality. This update is mainly to address a question/suggestion we had in some other threads about temperature 'dipping' and whether or not this could be built into the Hex-Nail's feature set. There's a lot of info explaining the UI a bit more in detail after that, too. Short answer: We already have this feature implemented and achievable in a couple of ways. The most obvious solution for this is, disabling the heater while the unit is still on. The Hex-Nail has Coil On/Off Capabilities are controllable via whatever means you like. Apps, Wi-Fi via a browser, Bluetooth, Touchscreen, etc. Thus achieving the desired effect by turning off the heater and allowing the temperature to drop to a desired level before re-enabling it (manually) and having it start to rise once again. We personally think that's a pretty involved way of getting this change to happen. So we'll do you one better. We will be expanding our already implemented 'Glob Mode' feature (seen briefly in the video above, more on that later.) to include completely customizable user preset 'Shifts' (which can be set and changed by the user at any time). You will be able to make a new preset for a temporary 'Shift' in temperature (in either direction), for a user set period of time (and user set temperature variation). You will also be able to choose how each shift starts and ends. Want it to go up in temp, then down? Done. Want it to down, then up? No problem. Want it to go up and stay? Fine. Needless to say there will be a deep rabbit hole when it comes to playing with the HN-01's 'Shift' options. You can choose to either track to the COIL or the NAIL temperature (and switch between them as you choose). Once you choose which to track to that value lights up (in this case, I've chosen to track to the nail temp, so it is brighter) and DOES NOT CHANGE as long as it remains selected. Since I've chosen to track to the nail, the middle number (orange) is now the current nail temp. The Hex-Nail will do it's best to keep this temperature the same as my set nail temp (green). Similar to your standard Set/Current PID interface. Since I'm not tracking to the COIL right now, that temperature is faded but it DOES update in real-time. If you switched to coil tracking it would become illuminated and LOCKED. 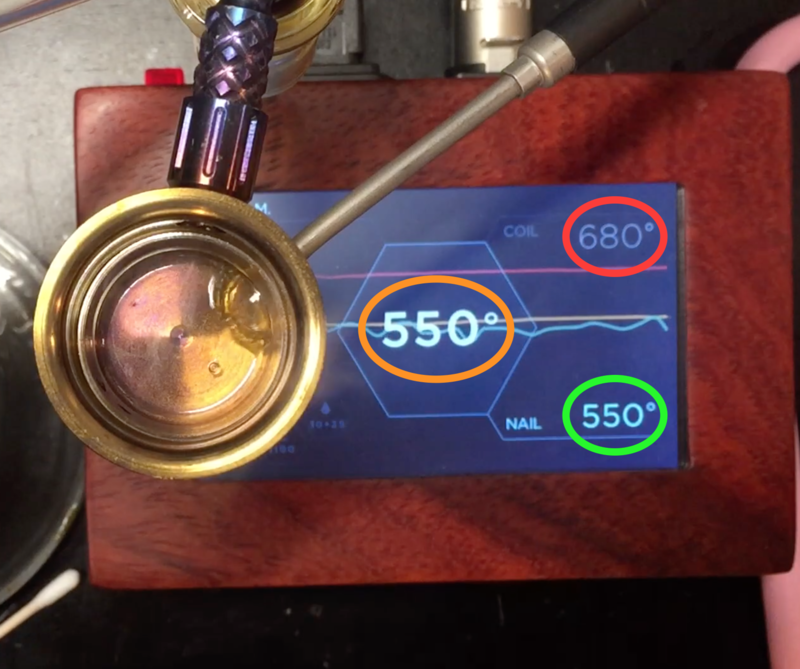 Moving your current coil temp to the center and fading out your NAIL temp (which will then update in real-time). It's really interesting to watch the 2 'real-time' numbers change independently of each other. Nail temp drops 2 degrees the coil temp may jump up 4 degrees to try to bring it back up. I feel like this seems more complicated without movement but if you watch the close-up melt frames in the Glob Promo (above) I think you'll get a handle on it pretty quickly. There's a few long shots in there that really show the functionality. The USB ports were actually left out of phase 2 prototypes on purpose. We're still trying to actually see if they can be implemented to our standards. We had them on early prototypes, but we traced noise in the tracking data to them (especially when actually in use for charging). We're looking into ways of properly isolating them from the rest of the internals (unfortunately the best solutions increase size). In the end we'd rather ship a more accurate, smaller, reliable controller without, than have them as a poorly implemented extra feature that hinders performance in the grand scheme of things. After building audiophile-grade amplifiers for a few months as a contractor in Austin at one point I have, unfortunately, already experienced major issues with interference from power 'noise'. The Hex-Nail's USB issue is similar to the effect 'dirty' power has on electronic components.